Convicted 06.03.1879 of being open out of hours. Fine 5/- plus 18/6d costs or 7 days detention. June 1866 - Sarah Banham fined 14s or 14 days for breaking a window of Mr William Clarkes public house. She had gone to fetch her husband who spent all their money there and stayed until 2 or 3 in the morning. William Clarke was accused of being open out of hours 11.03.1866. The house was then given as the PRINCE ALBERT. Thomas Palmer was summoned before the Bench Saturday 2nd February 1867 for selling beer out of hours on Sunday 27th January. Police constable Buckle had found the front door open and two men in the tap-room; a glass of ale stood upon a table. The defendant said that his brother-in-law had arrived at the house to take the defendant's children out and had been given a glass of ale by his wife. The Chief Constable elected not to press the case any further and it was accordingly dismissed. Address as Albert Street in 1868. Severely damaged by enemy action 18.03.1943. Address as 51 Devonshire Street in 1998. 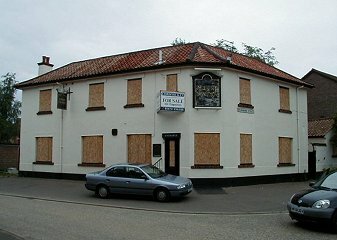 Closed and boarded up by June 2000. Bar and Lounge with painted wall panelling in both. Stood directly opposite the ALBERT STORES.